Elgin Academy's commitment to taking learning personally defines every aspect of our close-knit school community. The phrase perfectly frames the Advisory Program where each student is assigned a faculty advisor who serves as the student's primary advocate and mentor regarding academic and social issues. 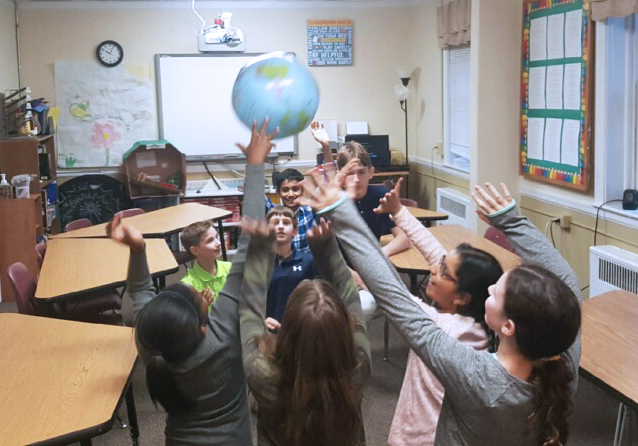 Middle school students receive a new faculty advisor each year during their Middle School experience (with all advisees coming from the same grade). Upper School advisories are a mix of grade levels. Students are assigned an advisor when they enter the Upper School and that advisor stays with the student for the duration of their Upper School experience. Advisory groups are comprised of approximately 6 to 10 students. "I get to know not just students, but families. These connections serve students well over the four years we are together" - Marie Cinquemani Thomas, Upper School Advisor. Advisory groups are comprised of approximately 6 to 10 students and are representative of the diversity of interests and backgrounds present within the Elgin Academy community. Advisories typically meet weekly in the Upper School and daily in the Middle School.
" I love the fact that this time of the day is built into my schedule so I have the opportunities to speak with my teachers if I need help on something." - Hareem, Middle School Student. Middle School Advisory bonding over a fun activity. "I find advisory time to be a good stress reliever because we do activities that help us release energy. This helps us be more focused in class." - Aaron, Middle School Student. Formal meetings with parents are scheduled twice a year, at Fall and Spring Learning Plan Conferences. Advisors are committed to proactively investing in relationships with their advisees and their advisees' parents and/or guardians, and they actively work with their advisees to cultivate community within their advisory groups. Both Middle and Upper School advisors are deeply committed to the advisory program and view serving as an advisor as an integral part of their role as educators. Advisors strive to be aware of all aspects of the the advisee's involvement with Elgin Academy—academic, social, athletic, and co-curricular. They play a key role in helping their advisees navigate the complexities of being responsible students while at the same time leading vibrant, active lives away from school. Advisees are likely to view their advisors as caring advocates who will come alongside them to champion their causes take an interest in their concerns, and celebrate their achievements. "My advisor is very much my "school dad," an adult who believes in me and pushes me to be my best." - Daniel, Upper School Student. 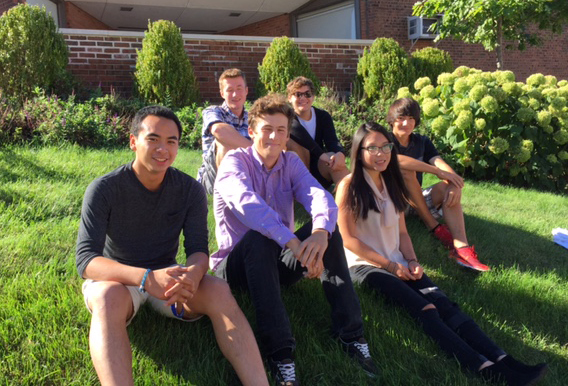 Upper School Advisory enjoying a sunny day! In the academic area, advisors seek to identify advisees' strengths and growth areas and to offer helpful direction accordingly. In the Upper School, particularly, where students have more freedom in course selection, advisors meet individually with each advisee and parents to shape the class schedule for the year. With regard to personal matters, advisors seek to create a climate in which the advisees feel welcome to share personal successes, struggles, and/or concerns and take the initiative in offering guidance when appropriate. Advisors also seek to encourage advisees to be meaningfully involved in the school community according to their unique interests and abilities. "Advisory is a mini-community with students from all different grade levels coming together on a regular basis and getting to know one another well. This creates a support group that extends beyond my circle of friends and my own grade level." - Maisy, Upper School Student.